No litters planned at this time. The next litter will be in 2020. I breed AKC English-type black and chocolate Labradors. I'm no longer breeding yellows. 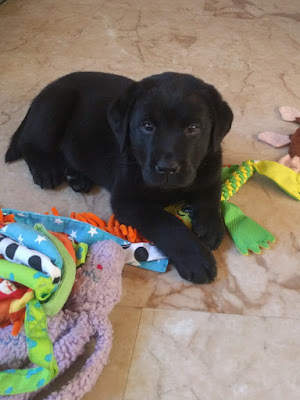 My goal is to breed intelligent, healthy, sound puppies with correct conformation, classic Labrador temperament, and a low to moderate energy level. An eager-to-please attitude and a desire to retrieve things are also priorities. I breed black and chocolate English-type Labradors. My girls and the sires that I breed them to have numerous health clearances including hips, elbows, eyes, cardiac by echocardiogram, and many DNA tests for inherited disorders including EIC, PRA, and D locus. You will be able to meet with the dam and several of her relatives. I plan one or two litter a year. I do not own the sires of my litters. They are selected based on their temperament, conformation, health clearances, and pedigrees. I will provide prospective owners with information about the the sire including the pedigree, health clearances, and a link to the stud dog owner's website if available. My puppies are raised in my home. For the first month, the puppies are in a whelping box in the guest room. At 4 weeks of age, I move my puppies into a spacious pen in my sunroom where they have room to play and grow. I provide them with a wide variety of toys. The puppies are exposed to a variety of sights, sounds, and surfaces. They also spend a lot of time interacting with friends and family. Weather permitting, puppies are in an enclosed 12 foot by 20 foot patio area and a 10 foot by 34 foot shaded grassy pen for several hours a day. They have toddler climbing toys and playhouses to play in and around. When the puppies are about six weeks old I start bringing them into other areas in the house and main dog yard individually. The are exposed to household sounds including the vacuum cleaner, dish washer, telephone, and radio. I strive to place each puppy in the home that I feel will provide the puppy with an optimal environment to thrive. The information from the prospective owners regarding their lifestyle, family dynamics, and the plans they have in mind for the puppy is an essential part of the selection process. The information obtained from the temperament testing and my evaluations of the puppies are used to match the puppies with their new family. A puppy to be placed in a home with young children, first time buyers, and seniors will receive careful consideration. There may not be a puppy in every litter that is suitable for these families. When the puppies are between seven and eight weeks old, they make the first trip the veterinarian. The puppies are checked for intestinal parasites and each puppy is examined to identify any health problems. They receive the first vaccination against canine several diseases. I provide the new owners with a copy of the New Hampshire health certificate, a small bag of dog food, a packet of information including care instructions and training tips, and copies of the pedigrees and health clearances of the sire and dam. I will register all the puppies in the litter with AKC.